Talk to local resources like Student Legal Services, Minneapolis Housing Inspections, Metro Transit, Parking & Transportation Services, 624-WALK Security program, Off-Campus Living and more to help you make an informed decision about living off-campus. 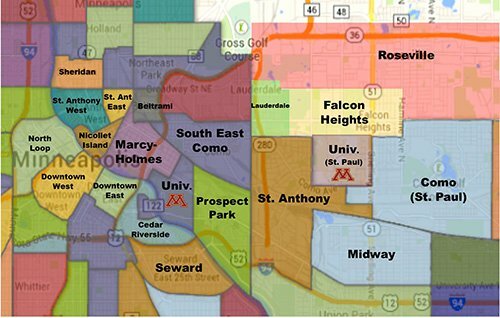 The majority of our undergraduates choose to rent in the east bank neighborhoods of Minneapolis: Marcy-Holmes, SE Como and Prospect Park. Other nearby neighborhoods include Cedar Riverside and Seward by the west bank as well as Falcon Heights, St. Anthony Park and Roseville by the St. Paul campus. Other neighborhoods that are an easy commute include those in Northeast Minneapolis and even Uptown (though it is pricier). We strongly encourage you to utilize the Off Campus Listing Service through the University. While it does not screen landlords on the list, it does prevent landlords with three or more unresolved or substantiated issues with Student Legal Services to participate. Learn more about the Off Campus Housing Program Policy.